A reflection on life, growing up, and becoming. I’m thirty-three years old, far too young to be conclusive in my draft of life lessons, yet old enough to have gone through a handful of life transitions. That is to say, I’m writing as someone who (according to life expectancy statistics) still have much life to look forward to, yet also have needed to say goodbyes—to people, places, and previous identities. So as far as life reflections go, here’s what I’ve been thinking about lately. The art of living and growing up is a dance between the me that I used to be and the me I am becoming. Between changing, yet staying the same. Sometimes the more current me is better, sometimes it’s not. Sometimes a change is welcome, sometimes it’s not. How to do this dance gracefully is the question. And to answer it, I have to turn to the wisdom of several wise writers. Meghan Daum in The Unspeakable via BrainPickings.org. Who we are today, physically, mentally, in character and personality, is most likely unrecognizable to our 4-year-old self. Our minds have changed, our bodies have changed, and our souls have changed. But at the same time, I can still hear the self-talk of my younger years. That soundless voice I speak to myself with, the one in which I am most eloquent, the one that can wallow in despair, and then empower—that voice is still very much the same, still recognizably me, today. This evolving self and the inner recognition that I am and have always been me, are beautifully described by Maria Popova as the “elasticity of being.” Our sense of self is continuous and schism-less, even in a changing body and outside circumstances. Part of this elasticity of being is also the enlargement of our personal identity as we grow. We are who we are. We have always been who we are. And we too are becoming more of who we are. Embracing more of who we are. Discovering more of who we are. For wisdom on this continuous “arrival,” I turn to the wonderfully titled Becoming by Michelle Obama. Michelle Obama’s deeply reflective account of her personal evolution, Becoming, is sandwiched between two gems. The first is on the first page, where she laments a trite question we ask of little kids. She used to answer pediatrician, because she learned that that was an answer that pleased the adults. She then lists the many things she has become in her “grown up” life—a lawyer, a vice president at a hospital, a director of a nonprofit, a working-class black student at an elite mostly white college, the only woman and African American in many situations, a bride, a grieving daughter, a stressed-out mom, and until recently, the First Lady of the United States of America—a loud testament that one, you can be more than one thing or have one career in your life, and two, it’s okay to change paths and become something different. The second gem is in her Epilogue, which to me captures the essence of the book. “At fifty-four, I am still in progress, and I hope that I always will be. For me, becoming isn’t about arriving somewhere or achieving a certain aim. I see it instead as forward motion, a means of evolving, a way to reach continuously toward a better self. The journey doesn’t end. I became a mother, but I still have a lot to learn from and give to my children. I became a wife, but I continue to adapt to and be humbled by what it means to truly love and make a life with another person. I have become, by certain measures, a person of power, and yet there are moments still when I feel insecure or unheard. 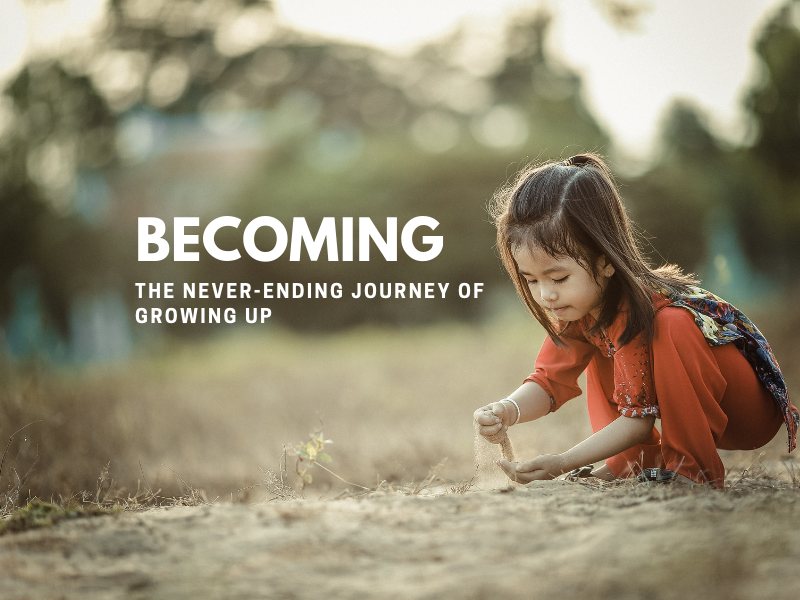 Becoming is an exploration inward and outward to discover deeper and more richly of self—this vehicle that we are given to pass through life on earth—and our purpose. If we are to embrace change and grow, by necessity we also have to learn how to leave things behind gracefully. Most of the time, the assumption is that we change into something better—in all sense of the word. But if we look at the human life as it truly is, in its whole scope, it is for certain not always becoming better. In fact, its end is always a decline. Our health gets worse eventually, our mind eventually declines, our financial situations may take a turn for the worse, et cetera. In these circumstances, you are leaving behind a situation that is better into one that is worse. These are the more extreme examples, but little examples show up everyday too. Don’t you ever miss something that you had in your previous life? For example, even though I am happy in my current life situation—being in a young family—I still get longing nostalgia, occasionally, of the times I was single or without kids. It does not detract from my contentment now; it’s not an either-or state of mind, but of both-and, of feeling two things at the same time. The key is not to let nostalgia turn into resentment. Surprisingly, to me, Marie Kondo’s advice on how to let go applies perfectly here. In her book The Life-Changing Magic of Tidying Up, Marie Kondo proposes a way to let go of things that may still be new, have sentimental values, or are gifts from important people, but they don’t “spark joy” anymore when you hold them in your hands: Thanking goods for their service. She says to thank them for showing you that this was a wrong purchase, or that people cared enough to give you a gift. Their purpose is then complete, and you can let them go. Who knew that you could KonMari nostalgia too? It seems to me that life is not a cumulative experience, in which we gather up goods, family, friends, job, kids, until one day we declare that we “have it all.” We can maybe have some, some of the time, and we can be grateful. Eventually, we will have to let go of this having-it-all ness. When nostalgia comes, we can linger in it for a little bit, grieve it if you will, be thankful of the chance to have lived the memory, and then let it go. Because life will be a continuous journey of welcoming and grieving, of entering new doors and leaving worlds behind. And the peace with which we pass through these doors is the degree of how gracefully we grow and age.